The DIY Joint is a place we love telling people about. We especially love telling people about it if our audience is people looking for carpentry classes in NJ or NYC. Such an audience is a bit less difficult to persuade to try out our open studio or to attend a class on milling lumber and joinery, where you can make a plant stand, picture frame, cutting board, or perhaps even some furniture! Not only do such woodworking classes give you super cool gift ideas (after all, hand-made gifts are far superior than anything store-bought, in our humble opinion), but they give you the tools to develop a new hobby, a hobby that might just turn into a passion. However, not everyone is actively searching for “carpentry classes NYC”, as the kids do these days. Some people are looking for a new hobby, but don’t know where to begin. If that describes you, we want you to know that The DIY Joint is a place for people of all backgrounds and skill levels. Whether you are looking for an open studio space that has all of the woodworking and joinery tools you could ever want, or are someone just wanting to try something new and maybe interesting, you are welcome at The DIY Joint. We have classes that introduce you to using common power tools, and we work hard to create a space that is comfortable and empowering for anyone who attends. 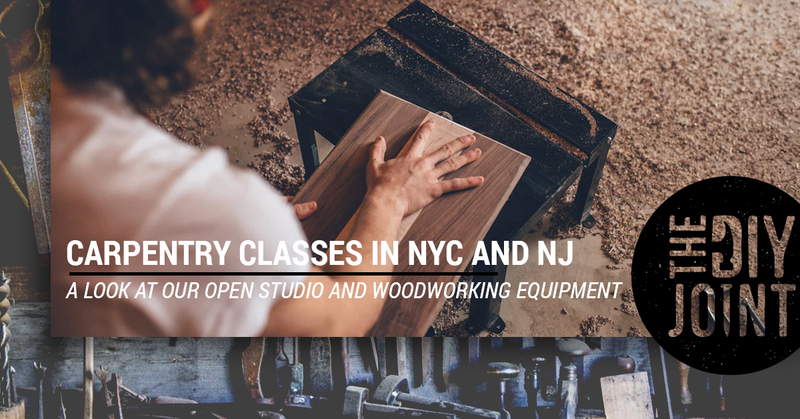 For people not necessarily interested in carpentry classes in NJ (we are in Hoboken, NJ, by the way), but are wanting to use our open studio, we want to let you know what you can expect. View our classes to find out which of our classes are “qualifiers”. Even if you have a good amount of experience in the world of woodworking, please understand that we can’t take the time to give everyone an individual test to make sure they have an honest appraisal of their own skillset. We have a studio filled with specialized tools, so we hope this makes sense. Plus, our classes are really fun, too! You don’t have to take a beginner’s course to get access to studio time, either, so take a look at our individual classes to decide which sounds best for you. Make sure you check out our policies on our Open Studio page to get details on purchasing, booking, and other pertinent information. As part of our efforts to make woodworking fun and accessible, we are able to offer wood delivery and storage for our members. All you have to do is order with our friends at Boards & Beams Lumber Yard. They’ll deliver to our studio, with the rate starting at only $25 per delivery. Storage rates are $45 per month and only $5 per day. You can order lumber here and reserve storage easily right here. Our location is in a loft layout, complete with a lounge area, storage, tablets, free WiFi, and a freight elevator to make things much simpler on everyone. We’ve done our best to have created a space that is fun, safe, and welcoming for people of all levels. We think being serious about our craft doesn’t mean we can’t have fun at the same time. We’ve got what you need to take a carpentry class in NYC without you having to bring anything yourself, assuming you’ve ordered your lumber. But even if you aren’t taking a class, you’ll of course have access to all our tools and equipment we have in our studio. Let’s take a look at some of the power tools you’ll be using. SAWSTOP 10” TABLE SAW – This is the world’s safest table saw, quite literally. It has saw break technology, meaning it is triggered by blad contact with skin in under 5 milliseconds. BOSCH 12″ DUAL BEVEL – make precise, quick cuts with this miter saw. With this dual-bevel model, you can make cuts in both directions without having to flip the piece. JET 8” JOINTER – This is used to make a flat surface along the length of a board and to square an edge. 150 PSI PORTABLE AIR COMPRESSOR – You’ll get an 18-Gauge Brad Nailer, a Crown Stapler, and a 16- Gauge Nailer in this kit. HAND SANDERS (ORBITAL & BELT) – This sander is great for sanding metal, plastic, and wood. BOSCH PLUNGE ROUTERS – This router is ideal for a variety of applications, including bit plunging, edge forming, slot cutting, and more. Don’t feel like you need to know what all these terms mean, either. JET 16.5” DRILL PRESS – The drill press is a precision tool used to bore square holes precisely and at exact locations. DEWALT 13″ PLANER – Run the board you are working on through a planer to give you a consistent thickness lengthwise. JET 14″ BAND SAW – You will be getting well acquainted with the band saw. You can cut irregular shapes with it, and even re-saw lumber into thinner stock, if need be. 8″ SLOW SPEED GRINDER – Use this to keep your assortment of other tools sharp and useful. HAND TOOLS – Our lineup includes back saws, carving tools, chisels, hand planes, and more. JET COMBINATION SANDER – This is a combination belt and disc sander powered by an electric motor. Use it to shape and finish wood. POWERMATIC TENONING JIG – The new Powermatic Tenoning Jig is the best on the market, used to cut tenons, which is the process of inserting one piece of wood into a mortise in another piece. If you don’t know what a mortise is, that’s okay. Come to our carpentry class in NYC and learn! WEN OSCILLATING SPINDLE SANDER – The ultimate sanding tool sets you up for easy use and smooth contours and curves, even when working on irregular shapes. HANDHELD POWER TOOLS – We’ve got a range of easy-to-use handheld power tools, including a jigsaw, circular saw, and some other usual suspects. We’ve got more tools and equipment in our studio in Hoboken, so you’ll just have to stop by in order to learn get acquainted with them! We would love if you got in touch with us and scheduled your first class today. All we are doing is providing a platform for people to get in touch with a deeper side of who they are – makers at heart. Schedule your class today!